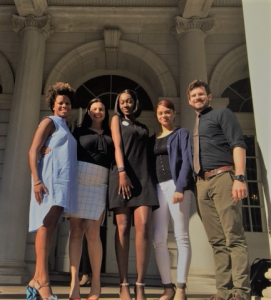 On May 24th, 2018, Samara Henry, a student at the Bronx Academy of Letters, testified at the New York City Council Executive Budget Hearing. Here she explains the crucial role of Action Civics. Read on! Good afternoon. Thank you for the opportunity to testify at today’s hearing. My name is Samara Henry and I am currently a senior at the Urban Assembly Bronx Academy of Letters. I am also an alumna of Generation Citizen’s Action Civics program. I’ve had the pleasure of participating in this amazing program my junior and senior year. Generation Citizen is an education program designed to get civics education back into middle and high school classrooms in an action oriented way. Through this, young leaders are empowered to use their voices in order to exercise their civic duties. Throughout the semester-long program, GC partners with schools to implement a twice weekly Action Civics curriculum during in-class time to educate middle and high school students about how to confront and take effective action to address community issues by engaging directly with politics. Attending a smaller school has many positive advantages. Our principal, Mr. Brandon Cardet-Hernandez, amongst others, empathizes the importance of self-advocating. Without it no impact or change can be made. It is made clear and especially stressed that our generation and future generations have an amazing platform and it is certain that we can bring about change, if the right incentives are put in place. GC can be seen as a stepping stone and is only the start of something brilliant. Serving as my debate teams chapter president I have acquired the much needed public speaking skills. Since the season is over, Generation Citizen has given me another opportunity to use my voice and speak up on behalf of not only my school but the community as well. As a millennial, my generation faces a number of problems, and who else rather than my own peers and hundreds of others across the states would be more fit to discuss and handle it than us? The Democracy coaches that assist us in our community issues are choosing to be alongside us in the classroom. I had the pleasure of asking my coach, Louie, why did he join Generation Citizen? He explained to me that it gave him a great sense of community issues and that it gave him hope for the future. Helping youth to further themselves and thinking outside the box is the key to ultimate change. These Democracy Coaches take over the classroom and instructional time every Tuesdays and Thursdays for a semester, this gives our familiar teachers the chance to see how their students are becoming civically engaged. It’s a proud moment across the board. Generation Citizen is necessary in our schools. As I conclude this speech, I would like you all to keep in mind how important it is to encourage our youth to be civically engaged. We are the future, and we need to ensure that they have the knowledge and skills about how our democracy works, and ways in which they can participate in it.